Over the last two weeks there have been more than 190 earthquakes of 4.4 or higher magnitude. Indonesia. On January 10th, the Mount Sinabung volcano located on the island of Sumatra threw up a new column of ash. The Mount Egon volcano which has been sleeping since 2008 is waking up now on the Flores island. The danger level in the region has been raised to level 3 out of 4. USA. On January 10th, the south-east coast of Lake Erie, New York, was hit by a storm. A drastic decrease of temperature during the storm caused icing. Cars were trapped under 10 cm of ice. Portugal. Severe floods hit the central and north regions of the country. Australia. A storm swept across the territory of Sidney. Wind reached 34 m/s. More than 40 thousand households were left without electricity. On the 13th of January, a sand storm passed through the state of New South Wales. On January 13th, light pillars eliminated Murmansk (Russia), and on the 15th of January people could observe similar light pillars in the state of Iowa, USA. 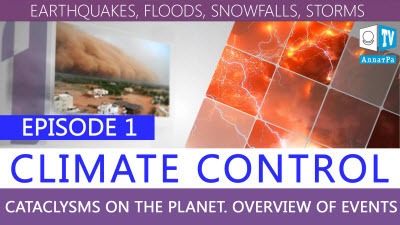 Read about ways to solve possible climatic cataclysms in the report of ALLATRA SCIENCE group of scientists “On the Problems and Consequences of Global Climate Change on Earth. Effective Ways to Solve These Problems”.